I received a video recently which had a profound effect on me. It is a compilation of various pastors speaking about the FEAR of the LORD. This piece is as much for me as for my readers. I will post the video at the end of this article. The words spoken by the preachers in the video, forced me to look deeply within my own heart and see if I had the kind of fear of the Lord of which the Bible speaks. Did I have the right kind of reverence and fear of our Holy and Righteous and All Powerful God? Do you notice that Paul said to the Philippians that they should obey God even more when Paul was not with them? He said they should work out their own salvation with fear and trembling. I believe that Paul was trying to impart to the people that they were to be always aware that their lives were laid bare in the sight of God; and that in His presence (always) they should have a holy reverence of Him. They should fear Him. I have said many times that God does not send anyone to hell – but that a person sends himself/herself there. I have repented of saying this to the lost. God DOES throw people into hell who have rejected His only Son, and insist on rebelling against Him! He is GOD. He created the Universe and everything in it. He spoke the heavens into existence. In the face of gross sin, which He cannot abide, this Holy God sent His only begotten Son, Jesus, to pay OUR sin debt – a debt we are not able to pay. He did this out of His great love for us. He wanted us to be reconciled to Himself. But many reject Him because they love their sin more. When you think of Jesus, do you still have him in swaddling clothes, in Mary’s arms? The beauty of His coming to earth as a baby is something that even the heathens love to celebrate. Many who do not acknowledge Jesus as Lord and Savior, will admire a creche – “Oh, how lovely!” they exclaim. Many in the Church are contented to keep the Lord Jesus Christ in a manger. They much prefer the celebration of his birth than they do the Resurrection! Without the Resurrection, we are all hell bound! “And when I saw him, I fell at his feet as dead. 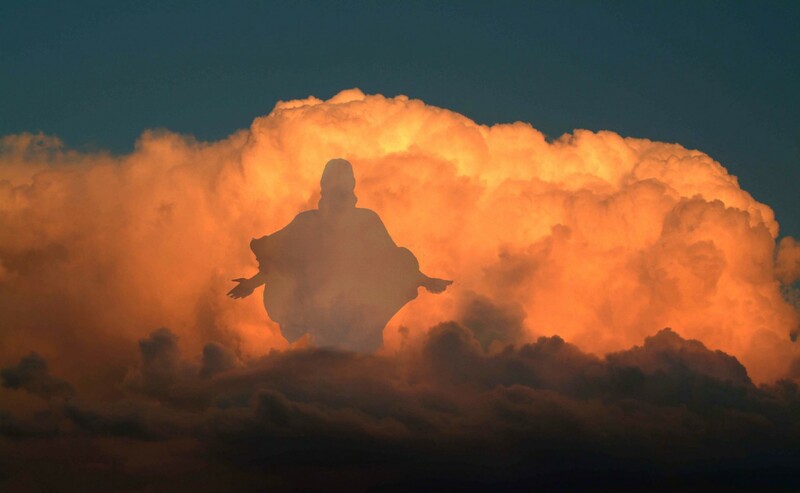 And he laid his right hand upon me, saying unto me, Fear not; I am the first and the last: I am he that liveth, and was dead; and, behold, I am alive for evermore, Amen; and have the keys of hell and of death” (Revelation 1: 17-18). I believe that the Lord told John to “fear not” because He knew that John had a holy fear of Him, but wanted John to truly understand, so that he could write down the words of his experience for us. Do you think because a church has thousands of members, that the preaching from its pastors must be sound and Scripturally based? The prophets of old did not draw large crowds! False prophets did. They told the people what they wanted to hear! Most of the mega churches are filled with people with itching ears. The leaders of these churches give the people what they want, as long as the checks keep coming in. No mention of hell or judgment. Woe to these preachers! The blood of their congregations are on their hands! How can we even attempt to fathom this truth about our God? Try to think about it! He is the Alpha and the Omega. He is Omniscient (All knowing) and Omnipresent (Present everywhere at the same time) and Omnipotent (All powerful). Oh Father, help us to never come before You casually. Help us to know You more, and to have the reverence and fear of You, which only You deserve. We struggle in this flesh, so please help us to worship You in spirit and in truth. We long for You and long to hear that last trumpet sound. Heaven is our home and we have come to detest this earth and all the evil in it. We know, Lord Jesus, that You will come at the appointed time. In the name of Jesus we pray. Amen.